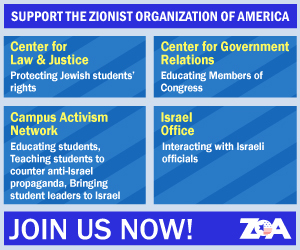 Morton A. Klein is National President of the Zionist Organization of America (ZOA), the oldest pro-Israel group in the U.S., founded in 1897. He is a member of the National Council of AIPAC. 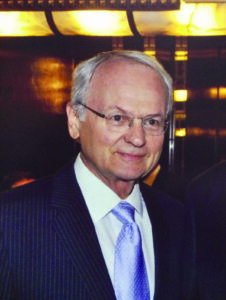 Mr. Klein is widely regarded as one of the leading Jewish activists in the United States. He is a child of Holocaust survivors, born in a displaced persons camp in Gunzberg, Germany. The national Jewish weekly, “The Forward” named him one of the top five Jewish leaders in the US today, stating “It’s impossible to deny that Klein has been extraordinarily effective.” The US Department of State has awarded Klein a “Certificate of Appreciation” “in recognition of outstanding contributions to national and international affairs,” after he delivered a major address there. He is a member of the International Board of Governors of the College of Judea and Samaria in Ariel, Israel. He is an economist who served in the Nixon, Ford, and Carter Administrations. He has served as a biostatistician at UCLA School of Public Health and the Linus Pauling Institute of Science and Medicine in Palo Alto, Calif., having worked closely with two-time Nobel Laureate Linus Pauling. He has been a lecturer in mathematics and statistics at Temple University. He traveled to Germany and persuaded the publishers of Baedeker’s, the world’s leading travel guide, to correct the many anti-Israel errors in Its guides to Israel and Jerusalem. He launched a campaign to correct dozens of anti-Israel errors in D.C. Heath’s “The Enduring Vision,” the most widely used American high school and college history textbook. Other campaigns by Klein dramatically reduced the number of anti-Israel lectures at Villanova University and at the largest church in the Philadelphia area. Mr. Klein is quoted internationally and has appeared in the media in countries including the U.S.A., Israel, France, Germany, Japan, Greece, Holland, etc. More than 300 of his articles and letters have been published in newspapers, magazines, and scientific journals around the world, including the New York Times, Washington Post, Wall Street Journal, LA Times, Washington Times, USA Today, Congressional Quarterly, New Republic, New Yorker, Commentary, Near East Report, Reform Judaism, Jerusalem Post & other leading Jewish papers, Philadelphia Inquirer, Miami Herald, Chicago Tribune, Ha’aretz & Maariv (Israel), Canadian Jewish News, Journal of Preventive Medicine, Journal of Epidemiology. Klein has appeared on TV and radio including ABC’s World News Tonight (4 minute segment on ZOA “Lobbying for Israel”), NBC National News, Jim Lehrer News Hour, O’Reilly Factor, CNN, Fox-TV, CNBC, MSNBC, NPR, BBC, C-Span, VOA, Israel TV/Radio. Lines from his speeches appear in the respected volume entitled “Great Jewish Quotations,” He is on the speaker’s bureau of UJC, and Israel Bonds. Mr. Klein is married to Rita, has a married daughter Rachael, and four grandchildren.